The PSA/DNA division of Professional Sports Authenticator, the world's largest sports memorabilia certification service, now is certifying the grade as well as authenticity of game-used baseball bats. The first bat graded was used by Babe Ruth and rated the highest possible designation, PSA/DNA Game Used (GU) 10. Well-known and respected bat authorities, John Taube and Vince Malta, now are exclusively assisting the PSA/DNA team of experts. "Our grading system will provide a strong foundation for the continued growth in the game-used bat collecting hobby. This is a foundation based on knowledge and research, not myth or hype," said Malta. "Our grading service will provide the highest level of certainty and trust that every collector deserves." The PSA/DNA grading standards for game-used bats are based on a scale of one to ten. "The core of the grading criteria is based on the strength or weakness of player use characteristics and/or the documentation that accompanies the bat. On a scale of one to ten, we consider the degree of likelihood that the player in question actually used the professional model bat. After determining that the particular bat is indeed authentic, our experts then consider a host of factors in evaluating the quality of a game-used bat," said Joe Orlando, President of PSA, a division of Collectors Universe, Inc. (NASDAQ: CLCT). Unlike trading cards where a designation of PSA 10 means Gem Mint, a game-used bat graded PSA GU 10 must show some signs of wear. "We are establishing a universal standard for grading bats so collectors will know the difference between a high-quality, mediocre and low-quality bat, whether used by Mickey Mantle or any other player. Collecting game used bats by theme is popular, such as bats of players with at least 3,000 hits or 500 home runs, stars enshrined in the Hall of Fame, and so on," explained Orlando. 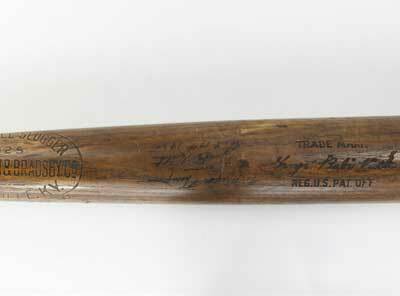 The first bat graded by PSA/DNA is an autographed and game-used Babe Ruth bat from his first season with the New York Yankees in 1920, and is graded PSA/DNA GU 10. It will be offered in an auction by SportsCards Plus and Sotheby's on June 10, and displayed at a public exhibition at Sotheby's in New York City from June 4 to 9, 2005. A PSA/DNA Bat RegistrySM will be launched similar to the current registration programs for cards, autographs and sporting event tickets. The PSA/DNA Bat Grading Guide and definitions of PSA/DNA Bat Grading Standards as well as information about submitting bats and certification fees can be found online at www.psadna.com. For additional information, call PSA/DNA's Customer Service representatives at (800) 325-1121.